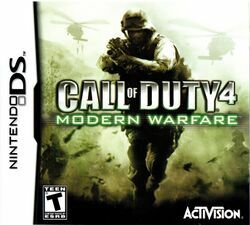 Call of Duty 4: Modern Warfare is the Nintendo DS version of Call of Duty 4: Modern Warfare. Like the later Call of Duty games for the Nintendo DS, it was created as a companion narrative to the main game. As such, it does not follow the same storyline; instead it follows other soldiers that played a smaller role in the conflict. The characters exist in the same setting but don't go after the main enemies like Imran Zakhaev or Khaled Al-Asad. This page was last edited on 28 November 2011, at 06:32.